Some of our customers choose to meet us when we are on the road as a matter of convenience. Check our Upcoming Events link to see if we have any road events planned. You can check out our Available Animals page to see a preview will be available for pre-purchase or at the show. 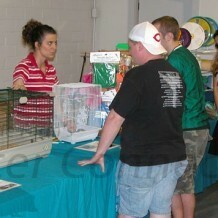 We do our best to give you the time and attention you deserve when you come to pick up your hedgehog. However, the very nature of the show does prevent us from giving you the same handling and buying experience you would receive at our farm. Also, if you wish to purchase a cage package or specific accessories you will want to reserve those items as well. We have limited space available and it is not possible to take our full inventory line to the show.